I tried to recall when was the last time I upgraded my computer systems, I guess it was err... at least 6 or 7 years ago? Anyway, if I tell you the CPU is P4 1.8GHz, no Dual Core or Core 2, no HT and whatsoever, then probably you could help to trace back the exact year, it was the highest end CPU when I bought it. And if you work in IT, a system/hardware/software usually comes into its end of life every 5 years or some even 3 years. Meaning that, my PC has passed through 2 disposal cycles. LOL. So, to keep up the trend and execute an upgrade plan, I have actually been observing what's in the market. Either desktop or laptop, I decided to go on the latter since I can easily convert the lappy into a PC. Even for lappy, hooh! So many options, so many new terminologies, brands etc etc... 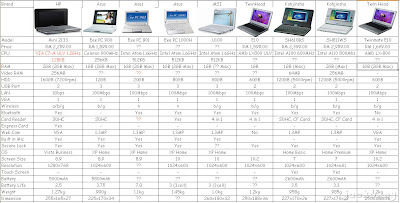 I then narrowed my selection based on some simple criteria: mobile, long lasting, powerful enough for my usage, internet-everywhere-ready, AFFORDABLE and MS Vista-capable is optional. I use my current PC primarily for internet and I can't live without internet, PDA can no longer fulfill my needs, so a lightweight portable device would fit my needs. As a result, 2 terms or device types came into my hunt: UMPC = Ultra Mobile PC and MID = Mobile Internet Devices. I guess most people, the non techie in particular, confuse or thought UMPC = MID. Me too initially. After some reading, I differentiate both in a simpler aspect, $$ or price. UMPC as it suggests, it's a full featured PC that is very portable and mobile to bring wherever you go and allow you to work on it on all sort of activities that you do on your PC. For instance, Auto Cad-ing. One UMPC example, the Sony VAIO TZ series (above at left) which costs you from RM6988 (~USD$2200). MID, also called netbook or mini laptop, on the other hand, it's a machine that is sufficiently capable to enable you to perform your internet activities i.e. browsing, chatting, video/audio conferencing and some basic work like spreadsheet while you're on the move. A good example is Asus Eee PC (above at right), which only costs you from RM1298 (~USD$400) onwards. If you are interested to read more, MSN has a good article too. Of course carrying a VAIO walking in 1U or sitting at Starbucks will surely draw some "blink blink", "wow wow" and chick attention, but I am very patriotic and obey to what our beloved G advised us, that to change my lifestyle, so I decided not to buy high end gadget like this (don't know if I can reimburse extra RM625 from G or not). Haha! Actually it's way out my budget and furthermore, I have a 2 year "Mega Project" on its way, so can't spend much in gadget department... From here, you probably know what am I getting, yes, the MID.